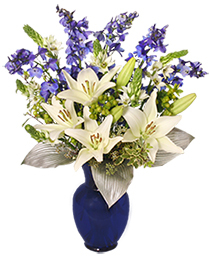 Beautiful Blooms Such As Blue Hydrangea, Crme Roses, White Lilies And Alstroemeria Along With Yellow And White Chrysanthemums, Eucalyptus, Limonium And More Are Beautifully Arranged In A Dazzling Cobalt Blue Vase. Celebrate the miracle of Hanukkah and the Festival of Lights with a beautiful Happy Hanukkah Bouquet from FLOWERS BEAUTIFUL. 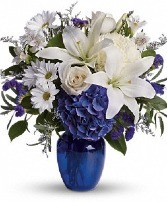 Call our shop or order Delta, BC Hanukkah flowers online 24/7.